A man wakes up marooned on a desert planet with his chest punctured. He gets up and staggers back to his lab, slow in his pace in pain and fatigued. Wounded and alone in the lab he must administer first aid to himself. There is no one to talk to and no time to think. He must either treat himself or he will die. There is no question in that moment about the futility of his survival and the challenges he will face if he is successful. There is only an immediate and inevitable task to complete to survive. No life flashing before his eyes. No admonishments of a crew that have abandoned him or questioning of his own decisions that put him in such a dire situation. 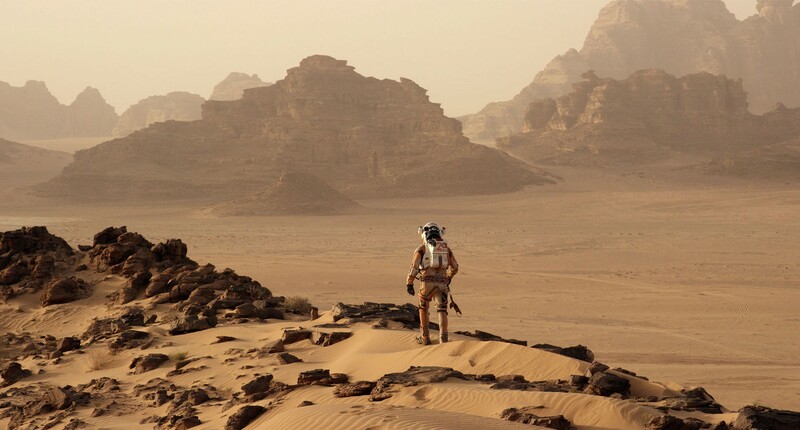 The whole scene is a microcosm of the film at large which is always first and foremost focussed on the survival of Mark Watney, the astronaut stranded on Mars after an emergency take off, played by Matt Damon. In earlier decades the role may have gone to Harrison Ford or Jimmy Stewart, movie stars that audiences easily relate to as one of them and actors whose greatest strength are underplaying the scene the more extraordinary the circumstances. If one is not a fan of Damon you can move on, I highly recommend for example checking out Mad Max on DVD this week but for the majority of the population this may be the best sci-fi film in years. Speaking of, Matt Damon and Ridley Scott need to buy screen writer Drew Goddard a drink and make it a double because he has made their best film each respectively in over a decade. Matchstick Men was the last time Sir Ridley scored this high and not counting the numerous Matt Damon supporting roles in films and indie hits this is his best blockbuster since The Bourne Supremacy, sorry people The Bourne Ultimatum is just a remake of Supremacy with diminishing returns. Where Goddard has gone right adapting from an original novel is where so much other recent output has gone wrong. In short the film’s greatest strength is its lack of ambition. No navel gazing here. Mark does not have a family waiting for him at home that he desperately misses, he just wants to live. There are no political allegories about rich and poor, ideologies, immigration, etc. No great questions about what Mars exploration could mean for our society and our place in the universe. At times Watney lies under his Rover in the Red Dirt and we may ponder how extraordinary it would be to live on another planet but while the camera takes in the locations it does not dwell on them. The film looks great but there is a businesslike approach to the shots of orientation not infatuation which coming from such a great visual stylist as Sir Ridley is a surprise but not a disappointment. Beneath the surface are a few points being made? The reaction of some at NASA to find him alive is to begin a dialogue about how this should be handled in the media but these seem like inevitable conversations that would take place between people who’s priorities are complex. At first the scenes on Mars are far more interesting. Watney’s plight is dire and daunting and yet the film has a cheeky sense of humour about it. See Damon deadpan about a failed experiment to camera after he blows himself up. As Watney finds a way to communicate with NASA his rescue and the film grow momentum. The people at NASA become warmer and their story more humorous by interacting with Watney. As Watney comes up with an ingenious way to grow potatoes so too do engineers back home have to problem solve a way to rescue him and their numbers grow with more offbeat characters. 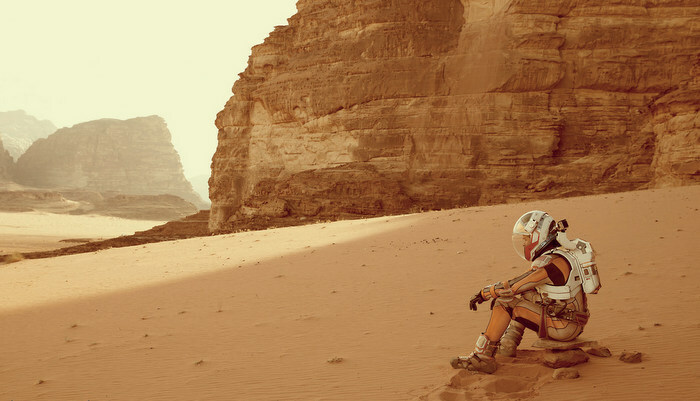 A sole human stranded and isolated on Mars humanises a group of bureaucrats sitting comfortably back home on Earth via increased contact with him. I don’t think this is unplanned by the filmmakers. (Without having seen the movie yet), surely “life on Mars” is the obvious on the nose Bowie song? Not necessarily subject matter wise but certainly in terms of title. Yeah, I was very much off with that. Emphasising that it was sight unseen. 1) Since Bourne Supremacy, are you forgetting True Grit and The Departed, or relegating those to “supporting performances” (along with the likes of Syriana and Interstellar)? 2) You’re (and I’m) probably underrating Kingdom of Heaven a touch, but for mine I’d go back to Black Hawk Down for the last time Ridley Scott has had a film this accomplished. 3) You didn’t touch on it, but I thought the editing in the film worked really well… not sure if this was a by-product of the screenplay – but little things like the cuts to the video diaries worked really well, as did the jumps (for example) between the crowded control rooms and a lone figure on a desolate landscape. 4) Not sure about you, but my inner nerd loved the Project Elrond scene. Partiucularly with Sean Bean. 5) One of the year’s best? Yah, I’d agree with you on that. 1. Yes. Granted you could argue he is co-lead in The Departed. 2. I prefer Black Hawk Down to Matchstick Men but the latter is a damn fine movie. 3.You’re absolutely right and why you should be writing reviews. I know I’d read them. 4. It was great. Made me smile.